There’s a nice update today from Spacecraft Operations Engineer Armelle Hubault, working on the ExoMars TGO flight control team at ESOC. This graphic (above) gives a very concise visualisation of the fantastic progress we’ve made with aerobraking to date. It was coded by my ExoMars TGO colleague Johannes Bauer; the bold grey lines show successive reductions in the ExoMars TGO orbital period by 1 hour; the thin lines by 30 mins. We started on the biggest orbit with an apocentre (the furthest distance from Mars during each orbit) of 33 200 km and an orbit of 24 hr in March 2017, but had to pause last summer due to Mars being in conjunction. For comparison, this speed is more than twice as fast as the speed of a typical long-haul jet aircraft. 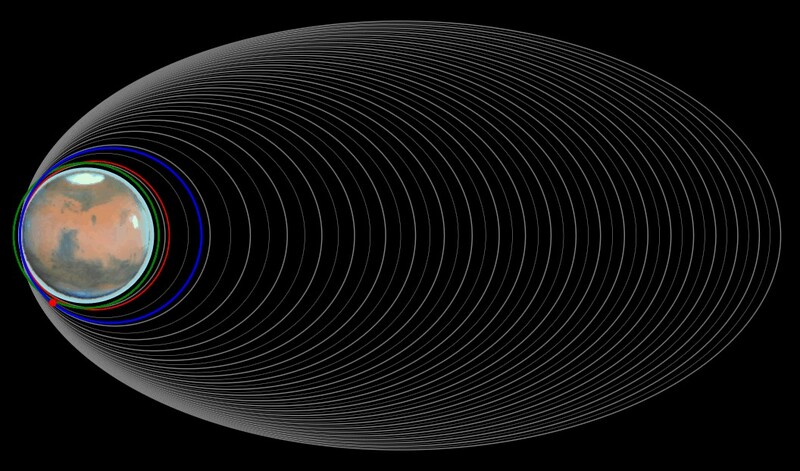 On Tuesday this week at 15:35 CET, the spacecraft was where the red dot is, coming out of pericentre passage (passing through the point of closest approach over the surface – where Mars’ thin, uppermost atmosphere drags on the craft the most to give the braking effect). The blue line is the current orbit, which takes only 2 hrs and 48 min and with the apocentre reduced to 2700 km; the red shows the final aerobraking orbit we expect to achieve later in March. Then, we will use the thrusters to manoeuvre the spacecraft into the green orbit (roughly 400 km circular) – the final science and operational data relay orbit. The image is pretty much to scale. We have to adjust our pericentre height regularly, because on the one hand, the martian atmosphere varies in density (so sometimes we brake more and sometimes we brake less) and on the other hand, martian gravity is not the same everywhere (so sometimes the planet pulls us down and sometimes we drift out a bit). We try to stay at about 110 km altitude for optimum braking effect. To keep the spacecraft on track, we upload a new set of commands every day – so for us, for flight dynamics and for the ground station teams, it’s a very demanding time! When TGO skims through the atmosphere, it has to adopt a specific orientation to optimise the braking effect and to make sure it stays stable and does not start to spin madly, which would not be optimal. We are basically using the solar panels as ‘wings’ to slow us down and circularise the orbit. The main challenge at the moment is that, since we never know in advance how much the spacecraft is going to be slowed during each pericentre passage, we also never know exactly when it is going to reestablish contact with our ground stations after pointing back to Earth. We are working with a 20-min ‘window’ for acquisition of signal (AOS), when the ground station first catches TGO’s signal during any given station visibility, whereas normally for interplanetary missions we have a firm AOS time programmed in advance. With the current orbital period now just below 3 hrs, we go through this little exercise 8 times per day! Approximately what is the mass of the satellite now?